Royals Corner: KC Royals News, Updates and Information: RC reports on Butler's defense...Scorpions clinch title bid! RC reports on Butler's defense...Scorpions clinch title bid! 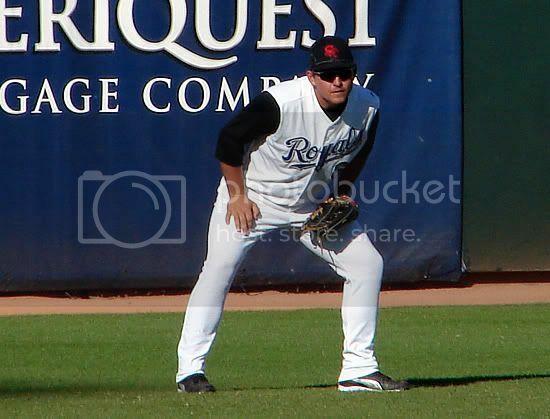 RC saw Billy Butler play two games in left field last weekend. RC gets many mailbag questions each week, but perhaps the most frequently asked is what the long-term prognosis is for Billy Butler in left field. Read almost any publication such as Baseball America, and it's littered with comments from anonymous scouts about how Butler is destined for 1B or DH duty. One scout quoted by BA even went as far to say "Butler doesn't play left field, he just stands in left field." Well, RC got a decent but short look at Butler's defense -- we saw him play two games in left field, and we got the chance to watch him take some outfield practice prior to the game on November 3. After hearing and reading nothing but negative comments for months, we were a little surprised when Butler didn't spike himself on his first defensive chance. In fact, in the two games we saw him, Butler looked quite comfortable making routine plays. In all, we saw Butler flawlessly record five putouts, in one case even calling off the shortstop on a short pop-up to left. He took fine routes to the balls we saw hit in his direction, but we didn't get to see him challenged by anything hit to his right or left. Butler retires Rafters' catcher Andy Wilson on a fly ball on November 5. Actually, this photo makes this routine play look a little more awkward than it really was. The only moment of brief panic came in the game on November 5, in which Eric Duncan lifted a high fly ball to deep left-center, and the Scorpions' CF Josh Anderson failed to call off Butler, even though it was clearly his ball. At the last moment, Butler lunged to his left to snare the fly ball, and disaster was averted. From RC's perspective, the blame for the miscommunication goes chiefly to Anderson, because a CF should take whatever he can get to. During his outfield practice session, RC was preoccupied with taking photos, so we didn't get as good a look at Butler's skill as we would have liked (we falsely assumed at the time we'd have other chances to see the Scorpions take infield). However, from what we saw, Butler has a roughly average arm from left, and he didn't seem to have much trouble directing his throws, either in the games or in practice. He could use some work in releasing the ball a little more quickly, but that's chiefly a footwork problem that can be corrected with more experience. 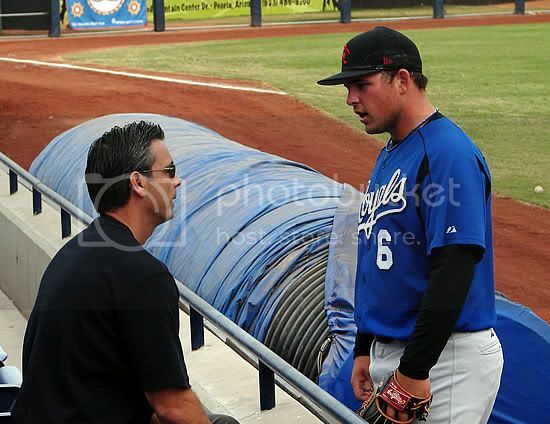 After watching Butler take outfield practice on November 3, Royals scout and Special Assistant to the General Manager, Luis Medina, called Butler over to the stands to offer some advice. If there's one glaring weakness in Butler's defensive play, it's his speed, or lack thereof. He was slow getting back on a Brad Eldred double hit over his head, as he was retrieving a couple doubles hit down the line. However, if you're going to have a slow outfielder, left field is the place to put him. A slow LF isn't going to play doubles into triples the way a slow RF will, so the damage is mainly limited to balls he's too slow to catch in the air. Since we didn't see any such opportunities, we still have no good idea of how Butler plays difficult fly balls. However, any suggestion that Butler might one day be a RF -- as Allard Baird suggested at midseason -- has probably already been completely dismissed by the Royals' brass. Nevertheless, we came away from Arizona with a belief that the Royals will be able to play Butler in left field without having him embarrass himself. No, he's certainly not going to be any kind of asset out there, but if he can manage to make the routine plays consistently, his offensive prowess should more than make up for any defensive deficiencies. We'd like to see more before making an iron-clad prediction, but right now we believe Butler will make his Major League debut in left field at some point in 2006. Whether or not he will stay there remains to be seen. We have a few other notes for tonight. First, we were informed by RC correspondent Chris Ray at 7 p.m. that the Scorpions tonight clinched the American Division title, and they will play the National Division champion Phoenix Desert Dogs on Saturday for the Arizona Fall League Championship. Ray left a voicemail for RC that included nothing but the sound of Queen's "We are the Champions" in the background. We understand he didn't have any actual champagne on hand to celebrate with, so Ray went with the next-best thing -- the Champagne of Beers. Congratulations to both Ray and the Surprise Scorpions! We understand the game will be broadcast on mlb.tv, so be sure to check it out. Also, RC is pleased to report that we believe we've solved the video problem we were having. Most folks using Internet Explorer were able to view the videos without any problem, but people using Netscape and Mozilla reported trouble. Below are three links that will provide you with all the quality video we shot of Butler, Alex Gordon, and Matt Tupman. As long as you have a working media player and a decent Internet connection, you shouldn't have any further problems. Thanks for the outstanding updates, pics and video from AZ. If you're going to do any more entires on your trip, I'd love to hear your thoughts on Bass and Tupman. Thanks man. I am planning something on Bass and Tupman, but I'll probably combine the two because I didn't get a whole lot of material on either. But here's the very short version: I like Bass's curveball quite a bit, and I like Tupman's swing.